42 Is A very good film that shows greatness on the part of both black and white. 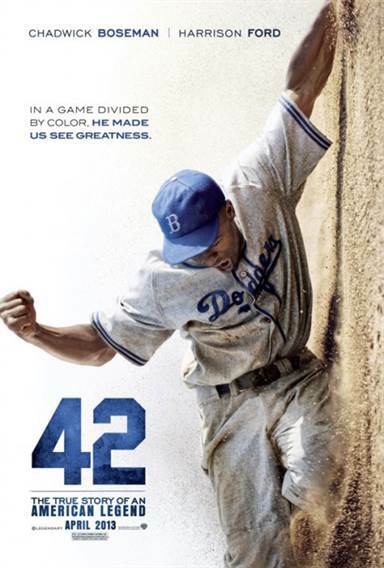 The movie 42 hits a home run in acting, directing and cinematography. The storyline takes you on a journey of courageousness in the face of racial discrimination and a door opener for others that followed. It's not just about baseball, but also of heroes and the right to play the game. The film centers on Jackie Robinson (Chadwick Boseman), a high-strung player in the minor leagues who gets a call from the General Manager of the Brooklyn Dodgers, Branch Rickey (Harrison Ford). Rickey asks the man if he would like to change the world of baseball. While Robinson thinks about his answer, we see the stone face of Rickey as he waits for the response. Agreeing, Rickey gets the ball rolling, but in the meantime Robinson will have to be strong in the face of a hatred that has been embedded in the American South for 75 years. Robinson did more for baseball than any player, including the famous Babe Ruth and Joe DiMaggio. For that, his jersey number, 42, is the only number that has been retired from the game by EVERY baseball team. It's a tribute to the man who stood up against terrible odds and faced his fears for a chance at achieving his dream. He may be just one man, but he represents a race that found a way to break the barrier and shatter the glass ceiling of professional baseball. The acting by Chadwick Boseman, best known for his role as another great athlete Floyd Little in the movie The Express, is outstanding in this film showing the stubborn, righteous, courageous and loving sides of Jackie Robinson. His ability to stretch out his legs and move around the bases like an actual athlete makes him look like the real Robinson stealing an extra base for the team. But his best performance comes in the locker room where he has to endure the constant taunting and character humiliation by his own teammate. In one scene the opposing coach mocks Robinson while he's attempting to bat. Here Boseman shows the temper control of the player in a display that tugs at the heartstrings and puts the whole movie in perspective. Harrison Ford shows Branch Rickey's stubbornness, will power and sympathy for the situation he brings to the forefront. Ford shows Rickey's tenacity to keep moving forward to break the barrier no matter what the consequence. Moving the clock back to the late 1940's America, 42 writer/director Brian Helgeland (A Knight's Tale) brings all the nostalgia with unique sets, props and costumes. It was an era when World War II finally came to an end and America were still reeling from the loss of so many men. Helgeland takes some of his screen time to show the return of our American war heroes before introducing his own two champions of humanity. Working with wide shots of the playing field and tighter ones of the jeering crowds in the stands, he works his magic showing the contemptibility. In one scene he shows a white father with his son at a game scoffing Robinson. The boy looks as his dad who is red in the face and shouting, not for the team, but to make one black man feel he's not wanted in the sport. A moment later, the boy starts mimicking his father to shows his support in a sad show of how grownups transfer their hatred. "42" has been rated PG-13 by the MPAA for thematic elements including language. There are a lot of slurs and name calling in the film that may be unsettling for some people, but it would have been hard to show the magnitude of the discrimination and disparagement without it. Download 42 from the iTunes Store in Digial HD. For more information about 42 visit the FlickDirect Movie Database.